Edward Welby Pugin (11 March 1834 – 5 June 1875) was an English architect, the eldest son of architect Augustus Welby Northmore Pugin and Louisa Barton. His father was a famous architect and designer of Neo-Gothic architecture, and after his death in 1852 Edward took up his successful practice. At the time of his own early death in 1875, Pugin had designed and completed more than one hundred Catholic churches. He designed churches and cathedrals primarily in the British Isles. However, commissions for his exemplary work were also received from countries throughout Western Europe, Scandinavia and as far away as North America. 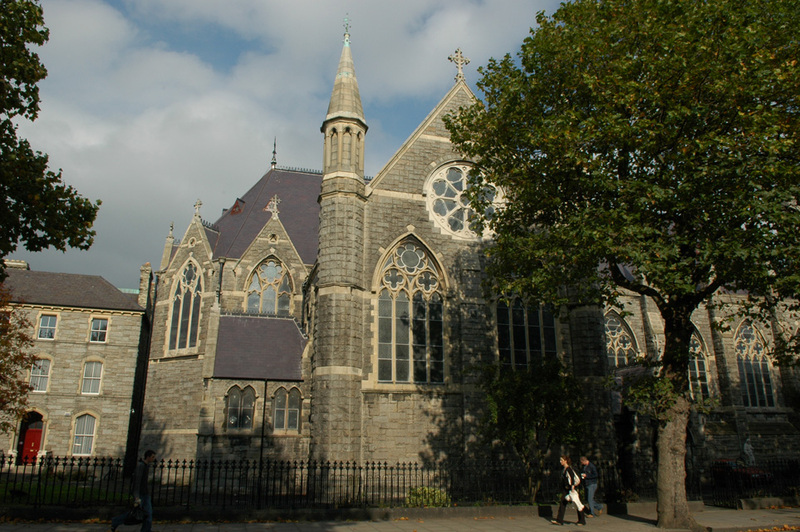 Regarded as Dublin's finest Victorian church, SS Augustine and John (John's Lane Church) in the Liberties area was designed by E.W. Pugin and executed by his partner George Ashlin for the Augustinian Fathers. It was built between 1862 and 1895. It has the tallest spire in Dublin (231 ft), and occupies a prominent position on high ground overlooking the Liffey Valley. It has a striking polychromatic appearance, being built in granite with red sandstone dressings. The eminent Gothic revivalist Ruskin is said to have praised it, describing it as a "poem in stone". Statues of the apostles in the niches of the spire are by James Pearse, father of Padraig and Willie, who were executed after the 1916 Easter Rising. There is some good stained glass from the Harry Clarke studios. ^ "All Saints' Church". Images of England. Retrieved 22 December 2007. Michael Fisher, Pugin-Land: A W N Pugin, Lord Shrewsbury and the Gothic Revival in Staffordshire, Stafford Fisher, 2002. Rachel Hasted, Scarisbrick Hall – A Guide, Social History at Lancashire County Museum Service, 1984. Frederick O'Dwyer, Ecclesiastical Architecture from 1829 in W.J. McCormack (ed) Modern Irish Culture, Oxford:Blackwell, 2001. Frederick O'Dwyer, A Victorian Partnership – The Architecture of Pugin & Ashlin in John Graby (ed) 150 Years of Architecture in Ireland, Dublin, Eblana Editions, 1989. Jeanne Sheehy, The Rediscovery of Ireland's Past, The Celtic Revival 1830–1930. London 1980. This page was last edited on 22 April 2019, at 23:29 (UTC).